Roll-to-sheet lamination and cutting machine applications for laminating of 2-layer or 3-layer or 5-layer 300-600gsm paper into different thickness paperboard.It has feature of compact structure,easy operation and energy saving.Fully automatic lamination greatly reduce production cost and improve production quality. 1. 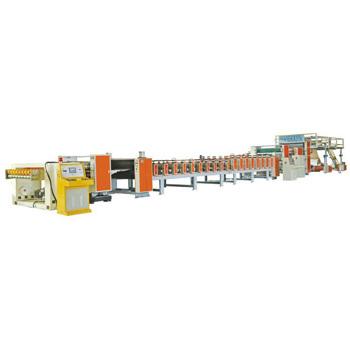 It is made of hydraulic shaftless unwind stand,transmission system,pre-heater,automatic edge tracking machine,coating machine,lamination machine,compaction & shaping machiine,traction & slitting machine,automatic sheeting machine and automatic stacker. 2. This line requires more than 30 meter length working space. 3. With hydraulic shaftless system to load jumbo roll onto unwind stand,cam size is 3"-6" for different paper cores. 4. With water-based glue/starched glue lamination. 5. With automatic ultrasonic tracking system to keep paper in a vertical line so that laminated in smooth edge. 6. With 3 sets slitting blades for edge trimming and slitting,edge width can be 30-50mm. 7. With computerized spiral blade,small cutting force to making cutting edge clean and reduce sheeting cost.Blade is from Taiwan.